The science of Kabbalah talks about the spiritual world and the forces operating in nature. These forces influence the matter of our world, creating various images in it, which results in an entire universe with everything filling it: still objects, vegetation, animals, and people. But we see all of this on the screen in the reverse part of our brain, and that is why it seems to us that this is in front of us. That is how we imagine reality. That is why the science of Kabbalah is separated from this entire false picture, even though this picture is what helps us to attain the depth of creation, its intentions, and the Creator’s character. Yet in essence, the science of Kabbalah teaches us how to go from this external picture to the inner, true state where only two forces remain—the force of the Creator and the force of creation. Of course, each of them divides into many more parts, particular forces and actions. But in essence it is talking only about forces: the will to receive, the will to enjoy, and what happens between them. This makes up all science. If a science talks about the interaction of these two fundamental forces, then we have the science of Kabbalah. And if it talks about various results from them on different levels of matter—still, vegetative, animate, and human, then we have the sciences of this world. Of course, these sciences are true because they give us knowledge about the external behavior through which the action of these two inner forces is expressed. But these sciences are very limited and we can only rely on them within the boundaries of our narrow world. It turns out that the science of Kabbalah, which explains the two fundamental forces operating in nature, is the basis for all other sciences. And that does not include just the natural sciences that study nature and the external world, such as physics, chemistry, biology, and zoology, but also those belonging to man directly, such as music, dance, and art. All of this is also part of the “seven fundamental external sciences” because it gives us knowledge about man’s abilities to perceive and sense his world. What Is The Formula Of Inspiration? Is it correct to assume that it is enough to have one person who, by having made his free choice, can open the path of further development to all other levels of nature, which cannot evolve further without it? Answer: Certainly, by using his free will, one person can open the path to and ensure further development of all the still, vegetative, and animate levels of the human pyramid if all of them unify with each other and join this human degree. This is how Rashbi, the ARI, and Baal HaSulam opened it for us. One person can draw and lead all the others if he is at the “speaking” level of development, whereas they are at the still, vegetative, and animate ones. We see this in practice. How would humanity evolve if not for certain outstanding individuals who open the door to a new world for the others? But after such a person makes a breakthrough, reaching balance is up to all others who follow him. The former has done his job, as for instance, Baal HaSulam who revealed to us the entire method of the wisdom of Kabbalah; now it is up to us to actualize it. Until our work is complete, we won’t achieve equilibrium. He merely explains to us that the problem lies in our imbalance with nature and it’s necessary to come to balance. Nature in its integral form is the Creator. It is with Him that we must harmonize ourselves, meaning to reach equivalence of form, oneness. This is what we must implement. It is necessary to engage the whole world into it, which will require a lot of work. You may ask who is this person that makes all the difference and must use his free will? You are this person! It is every person who received spiritual awakening within and heard about the method of its realization from the outside. Only the initial awakening occurs within, and because of it, a person hears a call to him or her from the outside. As a result, one comes to a place where it is indeed possible to realize one’s free will. All the problems in the world are caused by the fact that Israel, those who are yearning for the Creator, are not carrying out the task they have been entrusted with. That is what Kabbalists write. We are not bringing the method of correction to the world or educating them about it. Essentially, the world is not expected to do anything; it just accepts this method from us, and we are the ones who put it into practice. Therefore, all work is supposed to be done by us. We start and finish it. The world will supply you with the desires (Kelim) if you find a way to appeal to and receive them from it. The world itself doesn’t perform any actions. In other words, its actions will derive from nature itself. It is written that “The nations of the world will carry Israel on their shoulders.” They will do it when the correction unfolds. However, only those possessing free will have two forces: the female and the male (the desire to receive pleasure and the desire to bestow it). They are the ones regarded as “Israel,” which means “straight to the Creator” (Yashar El). In the middle line they can draw the Light that Reforms for the entire world. There are four stages by which the direct Light expands to us from Above downward: the “world-year-soul” and the existence of reality. And everything we have artificially built as an addition to it is needed to attain a higher degree. We are building this addition to the upper one in the still, vegetative, and animate forms. At the still level, we create various objects; at the vegetative and animate ones, we alter nature; and at the speaking degree, we perform corrections in ourselves. It is all done so that later on, we will connect all this with the correct intention and reach a higher degree. At that degree, we will feel less numerous than we do at present, meaning more unified and bonded. Today, we experience the world filled with infinite details, the enormous universe, billions of people, and countless products and trash. But when we ascend to the next degree, we will begin to see how the world is contracting, decreasing in the number of details since we are all linking into one man with one heart. At each degree, we need to add our effort at the still, vegetative, animate, and speaking levels. Look how much we have already done, even in our world: How many plants we had to grow to survive, how much we had to alter in the animate world, and how many cities and what surroundings we built for ourselves at the speaking level. All of these are corrections, regardless of how these alterations look to us: bad or good. We add them at our degree below. We need all this metal and trash because we lack internal correction. As long as we are internally unreformed, we have to perform external corrections until we reach the state when they will no longer be necessary. Starting with our generation and forward, we will see that as we evolve, we will be contracting. All our immense activities and enormous enterprises will start to decrease, acquire a more “subtle” forms, and disappear. It’s getting simpler, more compact, yet more powerful, meaning more “spiritual” and less based on matter and more on energy. Question: Why did the Creator set up such a cruel joke: There wasn’t a drop of rain for a very long time, which resulted in a horrible fire, but as soon as people put it out by making unfathomable efforts, the very next day a heavy rain came down that only interfered with agricultural work? If the Creator controls everything, why didn’t He send the rain sooner? Answer: Along the same lines, you could ask: Why did He cause the fire to happen to us? After all, what would be the point of igniting a fire and then sending rain in order to put it out immediately? If I love someone, I won’t beat him up in order to then be nice to him. Clearly, everything comes from the Creator. As soon as the airplanes put out the fire, the rain immediately began, and this happened on purpose in order to teach us something. All of nature is the Creator, and there is no freedom of will there. Our freedom lies only in our attitude to what it happening. If I adopt a different attitude, then will the fire happen or not? Your attitude will change your reality or the way you perceive it. Instead of perceiving Upper Light that comes in the form of harshness (Gvurot), as a consuming fire, you will feel it as the warmth of love. This depends only on your attitude: Do you love it or hate it? Imagine that the person you hate most in the world is now hugging you. You will turn to ice, horrified by this embrace. And now think of how different it would be if you were hugging a person you loved. The only thing that comes to us from the Creator is love and Light, but we do not feel it and cannot accept it. From Above there is always Light coming to us, wishing to fill the common desire of the whole world and the entire universe overall. This Light methodically advances this desire to the goal, to equivalence of form with itself. If the creation below organizes itself in the appropriate manner, then it will feel a good attitude from Above. And if it doesn’t, then it will feel the reverse. Everything depends only on you! Nothing changes from Above. Even when we say that we can change something with our prayer, that we can raise MAN and receive a response from Above, MAD, which brings us Light and returns us to the Source and changes us, none of this affects the influence of the Upper Light in the slightest. The Light constantly comes to creation, leading it to the final goal. All the changes take place only relative to our sensation. No matter what, the train is moving forward and nothing can stop it or slow it down. The only thing that can help the world against all disasters and problems is a stronger connection, cooperation, participation, and attention to each other. This is the part that the world can fulfill. And the people around the world who relate to “Isra-El” (“straight to the Creator”) have to add their intention to this. Our work is on the intention. By connecting our intention, we will raise all these actions, all the common desires to the level of bestowal, back to the Creator. And then we’ll balance all these forces of nature that are falling upon us nowadays. In reality, these forces are good: All disasters, fires, and hurricanes are nothing but a stronger Light coming to us. But we can’t receive it properly, and that’s why it leads to disaster. If the Light of Hochma (Wisdom) is not received inside the Light of Hassadim (Mercy), it turns into four plagues. The Light of Hochma without the Light of Hassadim is called a sword (knife). The Creator always reveals a greater Light. He reveals Himself according to a special formula: He cannot and does not want to stop. He will not “wear our shoes” as He already has a complete program from the beginning to end of creation. 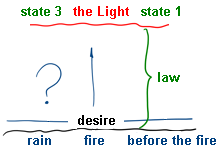 The first (initial) and third (end) states are already joined together and that’s why the program is working: The Light releases itself stronger and stronger with every moment. And according to this, if we don’t start working on greater similarity to Him all the time, disasters will continue. The whole world has to connect and help each other, putting aside all the hostility and childish bickering. And those who have a “point in the heart” and are called “Israel” have to add to this their screen and Reflected Light, meaning the intention of bestowal. And then everyone will unite together and achieve equivalence to nature, revealing the Creator for everyone! Each individual, according to his level and degree of participation, will discover the spiritual world.